Residents liviing in a Horncastle street have welcomed the introduction of a speed sign after a lengthy campaign calling for vehicles to ‘slow down’. A reactive speed sign - bought by Horncastle Town Council - has initially been sited in Stanhope Road but will be in operation at various other locations over the coming months. A campaign group - Stanhope Road Traffic Calming Initiative - believes the device will make a big difference and make the town’s streets much safer. 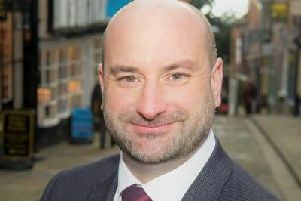 A group spokesman said: “The campaign group is grateful for the use of the device which is hoped will encourage drivers who routinely use Stanhope Road as a short cut to travel at a more responsible and reasonable speed on the residential road, which currently has a legal speed limit of 30mph - and not 40mph as on the main road. “Data provided by the Highways Department during a traffic survey in September 2013 showed that of the vehicles that used Stanhope Road, 22.9 per cent travelled at more than 31mph and 5.7 per cent in excess of or at 36mph. “A number of those were found to be travelling over 55mph, almost twice the speed limit in force. The group was set up in 2013 by local residents. They have also called on former MP Sir Peter Tapsell, Horncastle Town Council and Lincolnshire’s Police and Crime Commissioner Alan Hardwick to support their efforts. The group is still pressing for other measures to be introduced, including the possiblity of a 20mph limit and speed humps which are used in other residential areas. Town councillors have stressed they welcome any moves to make local roads safer, particularly for pedestrians. The sign was purchased by the council from its ‘parish projects fund’ as part of an ongoing commitment to road safety. With the assistance of Lincolnshire County Council’s highways department and other agencies - including PCSO Nigel Wass - 13 locations have been identified where speeding has been of particular concern to residents. Town clerk Gillian Mauger said: “The sign is of the design and type that flashes the driver’s speed if it is close to or over the speed limit. “The sign will be deployed for a period of six weeks at each of the 13 locations. PSCO Wass welcomed the introduction of the sign but stressed police would also continue holding speed checks at the various locations. He said: “We regularly check the speed of vehicles at a number of locations. “We always try to involve the community. Some of the sessions are pro-active in that they include residents and members of organisations. “Hopefully, we are getting the message across that drivers need to observe speed limits. Parents welcomed the introduction of the sign. Annie Wilson said: “I regularly pick up children from the primary school and crossing Stanhope Road can be a problem. “It’s not just cars, there are lots of HGVs using the road as a short cut between Louth Road and Spilsby Road so they miss out the Bull Ring. Pensioner Bill Newton said he believed more should be done to make Stanhope Road , and other town streets, safer. He added: “The town wasn’t built for so much traffic. “I can remember the days when there were a dozen or so cars a day down Stanhope Road. “Now, we get all sorts - cars, busses, lorries. I’m 84 and I don’t always feel safe. A lot of people my age think the same and it’s difficult for young mums on their way to school.